The ACLU this morning is sharing a video of a black man asserting his rights, standing with his hands up, who is suddenly tased. He falls and hits his head. Likely, though not provably at this time, he was tased for talking back to the police (in their eyes. In my eyes "I know my rights" is a fundamentally American statement that must be respected). Here's the tweet, which you can follow to the upsetting video. TASER (that's a brand name. CEW = Conducted Electrical Weapon is the type) are great tools for cops, allowing them to engage with dangerous situations without resorting to lethal force. They undoubtedly have saved the lives of many disabled people, for example, who might have been armed and threatening, but who the police managed to hit with a CEW rather than shoot. Too often, though, a new tool like this becomes used instead of replacing lethal force (let's call it the top of the force continuum, though likely my cop friends will correct my lingo! ), it's used down the continuum. Where once an officer might have used a nightstick or physical restraint, they now use an ECW. This is likely sometimes a good thing too! Physical scuffles are dangerous for everyone. But the Cult of Compliance keeps pushing to use the tool more and more often, so that anyone just standing there but not being properly obedient gets tased. And then we have a problem. I'm writing this because I've been thinking about the "restraining bag," as discussed in this fairly hyperbolic piece, about the NYPD's practice of putting people in certain forms of crisis into big duffel bags. 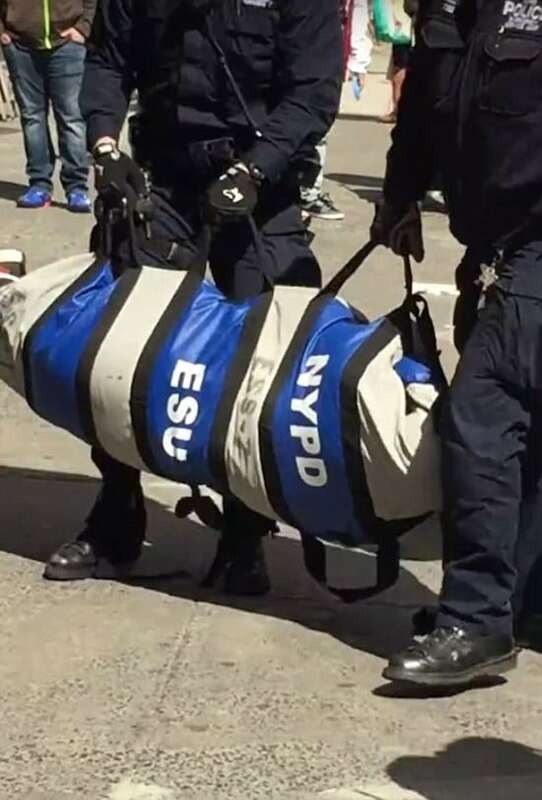 Image: The torsos of two officers holding a blue and white striped back saying NYPD ESU. Presumably, there's the body of a person inside, being "restrained"
The New York Times has followed up on the story. That's probably good. I'm glad to know about these bags so we can keep an eye on their use. I am sure there are plenty of difficult situations in which this bag is the right tool to wrap up a person and safely transport them to help. I'm also sure that, absent clear rules and consequences for breaking those rules, they will be mis-used. Does it have it's purpose? Sure. Extremely limited use though. As with any piece of equipment, it has the possibility of being misused and overused in the wrong circumstances. Every problem looks like a nail to he with a hammer. What is the so-called best practices, with broad application and highly adaptable? Team handcuffing, with multi-string of cuffs, hobble restraint (think: a cross between a tie-down strap & a dog leash) around legs/ankles, then secured to a paramedic backboard with the multitude of straps (like seatbelt webbing) and the head blocks w/ forehead strap. Is it too early to be discussing field-administered sedatives by paramedics? A team of cops & paramedics that I trained in the above tactics saved a young man's life last week who was wigging out on flakka or bath salts or some other fierce street drug cocktail. The man was "packaged up" for hasty transport to ER where he was in a physical position to be easily treated by ER staff. The trick was the hasty and decisive escalation by the cops to put the naked young man (~20) into the best position to be medically treated for a metabolic emergency where his body temp was so high he was essentially cooking himself from the inside. Would a restraint bag have helped? Maybe. But to what extent will there be a prolonged fight to get him into it? Then what sort of position is the person in to be treated at ER? So the picture is terrifying. The use is limited. I fear that every time there's a non-compliant individual, especially someone who is disabled (which means the cops will be influenced by anti-disability stigma, and likely afraid), the impulse will become, "bag them." Let's make sure that doesn't happen.